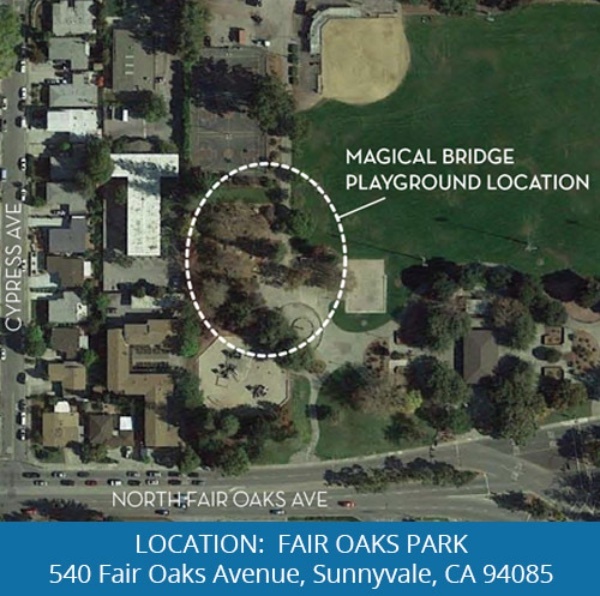 The Magical Bridge Foundation has announced Apple, one of the area’s largest employers, will help fund the Magical Bridge Playground housed in Sunnyvale’s Fair Oaks Park. With the tech giant’s Apple’s support, Magical Bridge will create the Innovation Zone, a dynamic space within the Sunnyvale playground for people of all ages and abilities to meet, learn, explore, create and build new and diverse relationships. Every aspect of a Magical Bridge Playground is intentional and leading edge, and the Innovation Zone lies at the heart of this concept, says Magical Bridge co-founder Olenka Villarreal. The Sunnyvale location is the third Magical Bridge Playground, with a goal to open to the public in 2020. The Sunnyvale playground will be nestled in the 15.2-acre Fair Oaks Park, serving the city’s 150,000 residents and even more tourists visiting the family-friendly area renowned for its tech and academic giants. The original Magical Bridge Playground in Palo Alto, established in 2015, serves 20,000 visitors a month. Magical Bridge Playgrounds are all designed to accommodate children and adults with a wide range of physical and cognitive abilities. One in five Americans lives with some form of disability and although radical cultural shifts have been made by the American Disabilities Act of 1990, public parks still do not adequately accommodate visitors who are autistic, cognitively challenged, visually or hearing impaired, physically limited or aging, Villarreal says. She saw an opportunity to change that, rallying nearly a decade of research, insights by inclusion specialists, and dedicated advocacy by community groups and nonprofit organizations. Generous corporate partners like Apple have been critical in breaking ground on Magical Bridge’s dynamic spaces made for everyone who wants to play, Villarreal says.